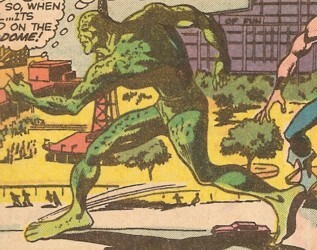 Powers/Abilities/Functions: "The Gargan-droid" was about 60-feet tall and had great strength. It was programmed to attack large, moving objects. 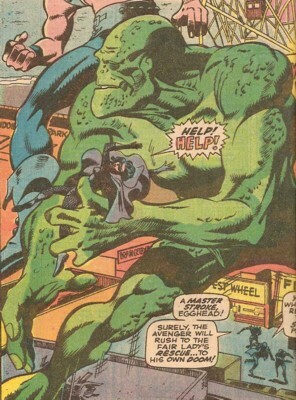 History: (Avengers I#63 (fb) - BTS) - At some point, the Mad Thinker designed and built the Gargan-droid. (Avengers I#63 (fb) - BTS) - The criminal alliance of the Mad Thinker, Egghead, and the Puppet Master captured the Black Widow and held her prisoner near the Coney Island amusement park. (Avengers I#63) - Sending a false message from Nick Fury of SHIELD to Avengers HQ, the three villains sent the heroes off on a wild-goose chase to the Caribbean to search for the Black Widow. Later, the real Black Widow broke free temporarily and radioed Hawkeye with a cry for help. Guessing from the background noise that she was near Coney Island, Hawkeye adopted the new super-powered guise of Goliath and went to the amusement park. Seeing Goliath's approach on his scanner, the Thinker activated the Gargan-droid and released it, carrying the Black Widow in its hand. When he attacked the synthetic giant, Goliath had to pull his punches for fear of injuring the Widow and some riders on a nearby roller coaster. After a brief battle, the two giants climbed to the top of an observation tower, and the Gargan-droid and Goliath continued to exchange blows, but as it threw its final punch at Goliath (who shrank to avoid being hit), the monstrous android fell over the side of the tower, dropping the Widow (who was fortunately caught by Goliath) as it fell, and plummeted to the ground, leaving a large crater from its impact, and presumably was destroyed in the fall. Comments: Created by Roy Thomas, Gene Colan and George Klein. "The Gargan-droid" was never actually named that in this story, but in one panel it was described as "a gargantuan figure," so I made up that name to distinguish it from the plethora of other androids out there. Unlike the Thinker's "regular" androids (which are colored green, but human-sized and usually featureless), the Gargan-droid was much larger and had monstrous facial features -- maybe to make it look more intimidating? (Yeah, like a 60-foot tall android isn't scary enough). The Thinker didn't build anymore androids this large again -- it may have been too expensive, and considering its performance here, I guess he learned that bigger was not necessarily better.